I thought you might be interested in two books I’ve devoured lately, as different from each other as a Bichon and a Bouvier, but both wonderful in their own ways. Right now I’m immersed in The Divine Life of Animals by Ptolemy Tompkins, subtitled “One Man’s Quest to Discover Whether the Souls of Animals Live On.” This is not beach reading, it’s a serious yet engaging inquiry about whether animals have souls. (Note that he asks that in the book, but answers in a way in the subtitle.) I’m only half way through, but I’m fascinated by it, and love that someone has taken the time to seriously ask the question: “Do Animals Have Souls?” To answer that question, Tompkins first takes us through a comparative survey of how different cultures and religions have perceived who animals really are, and who humans are in relation to them. What is especially interesting to animal lovers, I think, is the almost universal perception of early cultures that animals and humans were nowhere near as different or divided as is often believed today. The author writes: “Why are animals so important to primitive cultures? One big reason is that for primitives (just as for all the sages of the East), animals and people aren’t really all that different from each other. This belief caused considerable irritation to the anthropologists, linguists and other scholars of the late nineteenth century…” I’ve gotta love someone, who in the midst of a serious inquiry about animals, religion and the nature of life, writes sentences like that. Ptolemy even addresses the famous Rainbow Bridge poem (“Just this side of heaven is a place called Rainbow Bridge. When an animal dies that has been especially close to someone here, that pet goes to Rainbow Bridge… The animals (there) are happy and content…. and when you and your special friend finally meet… you cross Rainbow Bridge together.) He admits that he finds the poem a “little on the sugary side” (full disclosure, so do I, but it still makes my cry) but also that it brings up a critical issue to many: Can animals go to heaven? That question turned out to elicit more mail than he’s ever received from any one article he’s ever written. There are so many issues here, from do animals have souls (and thus, what is the nature of “animal” anyway, much less what is a soul? ), how have we humans thought of our relationship to other animals over time.If you believe in something like a heaven, do you believe animals go there? If you are interested in an intellectual discussion of these issues you’ll love the book. If you’re looking for a book to let your brain rest and to allow you to escape for awhile from reality, skip this one and pick up the next one. The Dog Who Knew Too Much is the 4th book in a series of mysteries written by Spencer Quinn. The books are about a struggling private detective (why is that character so popular… detectives are always struggling, right?) and his dog, Chet, and is written from the dog’s perspective. I have to admit that this is usually something that would put me off, not attract me. I haven’t been a fan of most books written from a dog’s eye (nose?) view; they just never seemed to click with me. That was true of The Art of Racing in the Rain, a huge best seller that thousands loved and I just, well, didn’t. (I wrote about that in an earlier blog.) But Chet and Bernie are now in my circle of best friends. I just downloaded the first three books onto my Kindle to accompany me to Scotland and England. If The Divine Life of Animals is a full course dinner, ranging from appetizers about the author’s love for his pet rabbit to the entree-rich and scholarly comparison of religious beliefs about animals, The Dog Who Knew Too Much is snack food. Good snack food. “Popcorn” books I call them, books that flow like water downhill and practically read themselves. In no way do I mean that to demean either the books or popcorn. I love good popcorn, and will argue to the death that snack food is an important part of a healthy diet. This fourth Chet and Bernie mystery is like really great fresh popcorn with just the right amount of real butter and salt, followed by, oh yes, an entire box of Junior Mints. Chet’s comments are laugh out loud funny. Here’s just one, early on when we’re learning about the two principle characters. “I remembered that day (the day that Chet found a new home with Bernie), a bad day–flunking out of K9 school just before the leaping test, my very best thing! Was a cat involved? Those parts are pretty hazy….” Chet is always having a vague thought that then leaves his mind as someone mentions bacon or he tries to sort out why someone would refer to your “baby blues” when his eyes are brown…. Everyone, understandably, reacts to books written in a dog’s voice differently, but for the record, this one works for me. I’d love to hear what you think about a range of issues — On a serious note, do you believe animals have souls? Whoa, I know, it’s a heavy question. (What are souls anyway?) Second, read any good books lately? I’ve got plenty of room on my Kindle to add more! MEANWHILE, back on the farm: After a few hot and nasty days, accompanied by some pretty serious rain (poor Katie in our office had her parent’s house attacked by falling trees), it’s clear and gorgeous. A perfect fall day. We count ourselves lucky to miss the floods, fires, hurricanes, earthquakes, tornadoes, famines and other dramas occurring all over the world right now. I’m hoping to get outside soon, but I’ve got some more work to do on the seminars I’m doing in Scotland, lots of house prep and packing, etc etc. Fall is such a busy time for foodies like me: I’ve got wild plums in the frig to process, lots of veggies to get in the freezer, organic local chickens to order, gardens to take care of…. As I write Jim is taking down the portable electric fence and cleaning out the water tank for the sheep. The lambs are thriving, they are almost fat the grass has been so rich this summer, so I’m cutting down on their grain. Willie boy is up to 3 20 minute walks a day, and much less indoor PT for us to do. When we come back, we can start him for very brief periods in the hobbles, off leash. Whee! 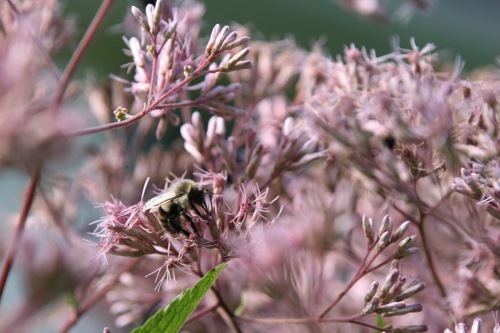 The bees are busy on the Joe Pye Wee. It’s hard work making enough honey to make it through a Wisconsin winter. 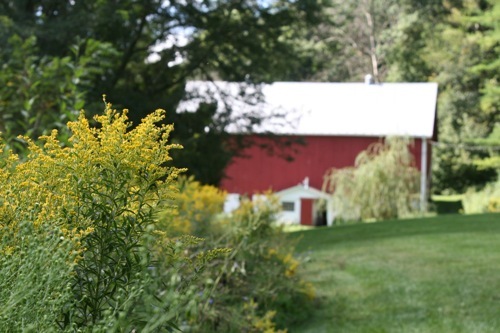 The Goldenrod is in its prime now; it will encircle the farm with its yellow gold blooms for another month. Looking for a good book? I just finished reading, for the second time, A Girl Named Zippy by Haven Kimmel. I laughed as much the second time as I did the first. It is a memoir of growing up in Indiana. It is a wonderful book. And there are some well-loved dogs in it. Well, the short answer is yes, I do think dogs have souls and probably most other animals, too. I’m not sure where or if a line would be drawn. I think we’re just separated by animals by degrees on a scale, not in fundamental nature. What might be surprising to add is that I’m an atheist. I like to think that there’s more to this universe than we understand, and that we’re all more than the sum of our biological and chemical parts, and that being alive makes us somehow special and that some part of our essence will live on when we die. But, there’s no evidence for that, none of the world’s religions are for me, so it’s just a hope of mine. All the more reason to try to value every bit of time we have hear and leave a good legacy behind. As a side note, I dont’ like the Rainbow Bridge poem, for a number of reasons. First, I don’t like much poetry, and “Rainbow Bridge” is not on the same level as Ginsberg’s “Howl”. Second, it is very saccharine and simplistic, and though the intent is beautiful, and it puts a lot of valid hopes into words, it frequently becomes what people say when a loss is experienced, as opposed to anything of substance. “Fluffy is across the bridge now” would be of no comfort to me, though in times of loss, what comforts one person and what freezes another is entirely individually based. I’ve always been fond of the story of the man and his dog who die and are travelling up to heaven. They reach a pair of Pearly Gates and a saintly looking gatekeeper says the man may come in but the dog may not. The man refuses to enter without his best friend and they walk on. The arrive at a rustic looking farm and stop to ask for water. As the man lets his dog drink first they are welcomed to heaven. What about that other place with the pearly gate and the golden streets asks the man. The reply “we just use that to keep the riff raff out; anyone who would trade the company of their best friend for streets of gold doesn’t deserve to go to heaven.” That summed it up pretty well for me. If my fur family can’t come too I don’t wanna go. Fortunately, I believe that animals do have souls and that I’ll be reunited with my beloved friends. I like the Spencer Quinn books too although sometimes Chet’s scatter-brained narration gets wearing. When stories are told from the dog’s point of view I try to imagine Ranger speaking like that. Mostly Chet talks like Ranger would, puzzling over what we call “human weirdness” and being much more interested in the world of smells but I’m convinced that Ranger is less distractable than Chet. Not that I haven’t known plenty of of dogs that are SQUIRREL I just don’t enjoy them as much. Lately, I’ve been reading a lot by David Sobel (I think I spelled that right) who writes about place-based education and ecophobia. Animals have souls. There is something about a being that has died that is missing — besides the breathing — and to me, that is the soul or spirit. I believe that. Don’t really care to examine that or debate it, I just believe it. All and all, I’m with the sage that said (was it Mark Twain? ), if there are no animals in heaven, I want to go where they are. Can’t imagine me without my horse, cats, and dogs. About books, I saved the last Harry Potter until I could part with the series, so I just read it this summer. And I read The Help and liked it. Jean Auel’s last in the Clan of the Cave Bear series is out. If you liked that series, The Land of Painted Caves might interest you. I’ll probably save that one for a year or two until I’m ready to say good by to the series! I have no idea if dogs or humans have souls, but I do know I love reading and Chet the Dog has been a favorite from his first book. I can’t wait to read The Dog Who Knew Too Much. I didn’t like The Art of Racing in the Rain either, but I thought it was just me. Rita Mae Brown’s Mrs. Murphy stories are told from the point of view of the cat, Mrs. Murphy, and some of them are great. I’d look at the reviews in Amazon to determine which one(s) to read. Seabiscuit was great if you haven’t read it, but you probably have. How to Say Goodbye in Robot was really good too, but isn’t about animals. Faithful Place and Outlander are among my all-time favorites too. The Glass Castle and The Guernsey Literary and Potato Peel Pie Society are at or near the top too. So many good books out there. One more and I’ll stop. The Country Life by Rachel Cusk has one of my all-time favorite lines it about how she doesn’t exactly blame her parents for all the awful things in her life, they share a certain amount of responsibility. I wish I could remember it exactly, but it was terrific. Can’t wait to see others’ recommendations. I’ll put them on my Kindle as samples so I can check them out! Sorry, the book on socialization is called A Dog Who’s Always Welcome, but it’s not available on Kindle. 🙁 I had to buy a hard copy. I don’t have any concept of what a soul could possibly be other than some kind of human fantasy. Do dogs fantasize about some kind of non-material entity ? Probably not. The Bible says God knows when a sparrow falls – that’s enough for me to know animals go to heaven. And all animals are His. Debating souls is a human issue – we need to remember the Psalmist “My (God’s) thoughts are not your thoughts.” She (God is above gender) is so much more than we give Her credit. I need YOUR new book about adopted dogs to give to my adopters! Have seen it is available (read “the Bark”this morning). I recently read a book which I kept putting down toward the end; I wasn’t concerned about the end – I just didn’t want it! Can’t recall the name. Sorry. I certainly wouldn’t want to go to any heaven where my animals wouldn’t be! I believe with all my heart that the essence of what we and they are continues on after the body dies. As for books: for a light read I really liked the whodunnits by Hazel Holt. They have a feel that’s reminiscent of Agatha Christie, set in an English seaside village. The detective is a middle aged widow, who has a dog and a cat, although these do not feature very prominently. The books are certainly in the “let your brain rest” category, but as such I found them quite entertaining. BTW, I’m in The Netherlands, and I will be flying over to Edinburgh to attend the seminar – never ever thought I’d get the chance to see you “live”! (I’ve seen most of your dvd’s). I’m looking forward to it sooo much!! I am reading an excellent book about debunking the training of dogs as if dogs wanted to take over you me and the world–premeditatedly! Talks a lot about what our canines retain from wolves and what they do not or maybe some traits are left over from even the pre-wolf era. I’m only half way through but the author also talks about the false assumption that dogs are classified in dominant/ submissive within a group etc. Dog Sense by Bradshaw. The UK title is: In Defense of Dogs. I do believe in heaven and eternal life. I do not claim to know what, exactly, that afterlife looks like since there is still much that remains about God that remains a mystery. However, as a Christian, I think God gives us both answers and promises. Where the answers end, God’s promises begin. And I trust God’s promise that ultimately I will be in his care. And I also believe that whatever heaven looks like, it will be a place of great joy, which for me, will include my dogs. Cats…not so much. HAHAHA JUST KIDDING! I do believe animals go to heaven. Although Jon Katz is persona non grata in many herder dog circles, I found his “Soul of a Dog” to be very interesting reading. He looks at what various philosophers and Christian teacherss have written about animals and souls and muses about our definition of morals, free will and reason and can it — should it — apply to animals, especially the animals we love. I don’t know that animals need souls, but I think humans need animals, so we will get some kind of manifsetation of our loved ones in heaven. I really enjoy the Chet and Bertie novels — Chet seems very much a real dog to me; more energetic than my own Pupper, but about the same attention span. Three recommendations: Pack of Two by Carolyn Knapp — well-written musings on our relationships with our dogs, personalized by one woman’s intense love of her dog; Homer’s Odyssesy, the rare cat book that is charming, not cloying, and no pet dies; and “A Primate’s Memoir” by MacArthur grant winner Robert Sapolsky, about his graduate studies of baboon troops in Kenya. It has one of the ugliest covers that I have seen, and the writing is hysterically funny, moving, and honest. I believe that every living thing has a soul. Or else no living thing does. That would indeed be heaven if I got to see all my animals again someday. I picture them all waiting for me in a big grassy field at the edge of the woods, hanging out with tongues lolling, watching for me. A very good book I recently read, no dogs but still a good book, was by Helen Simonson, Major Pettigrew’s Last Stand. Thoroughly enjoyable. I discovered the Chet and Bernie series while checking out mystery books on CD from the local library for my Dad, who has vision deficits and is in assisted care. Once an avid reader, he listens to about 5 mysteries a week. I sometimes listen to one of his books before returning it to the library (love Rita Mae Brown’s Mrs. Murphy books). Anyway, to make a long story short, if you love reading Chet’s point of view on paper, you should hear it narrated aloud by a professional actor with great timing and vocal nuance — the “dipsy-distracted-dog” aspect is HILARIOUS in that format. I also love it when Bernie says “Chet . . . Chet . . . CHET! For God’s Sake!”, as I have to admit that I holler something similar when my dogs are barking over silly stuff. And the descriptions of how people smell to Chet are just wonderful, and seem to be based in the science of how dogs can identify individual scents within the myriad of stimuli that enters their noses constantly. Good entertainment! As to the animal-soul question, Buddhist teachings posit that all “sentient beings” have an essential nature that moves from each incarnation to the next, but that we can only escape the cycle from a human lifetime. Our pets and other animals can potentially have a human incarnation in the future, so yes, they have a “soul” in that context. This is just my opinion, but it seems to me that the domestic animals who interact with humans a lot throughout their lives are closer to being able to realize that. I’ve wondered if dogs (and other animals) that are service dogs or act selflessly in various circumstances “earn” their human lifetime next time around. Complicated questions, but it’s interesting to just notice what “resonates” with our emotions as we move through the world. I had one of those “laugh-and-cry-in-the-same-moment” experiences a few years ago when I saw a bumper sticker on a small pickup being driven by a midlife woman with short-cropped gray hair. It said “If there are no dogs in Heaven, I’M NOT GOING”. I experienced such a heartfelt resonance with that statement! It’s hard to describe but it really synthesized my feelings about my fur-kids and what their relationship is to my path through this life, and the learning I need to do this time around. I do feel in my heart and gut that they are moving along the path of eternity with us. For something light, intelligent, well written and very English, you could try Anna Dean’s Dido Kent books. There are three out in paper back, although only the third seems to be listed in a Kindle edition in the UK. Think Jane Austen crossed with Agatha Christie, but they are better than that sounds! Have you read The Life and Opinions of Maf the Dog and of His Friend Marilyn Monroe? It’s one of the best dog-narrated stories I’ve read. I think I have to read The Divine Life of Animals. Ever since Descartes spoiled things for animals we humans have lost our connection to our fellow creatures. Saw this on a plaque some vendor had at a local dog club event: Heaven will not Heaven be if my dog’s not there to welcome me. Substitute cat, or in my place, animals. Seems to me Enlightenment and Science have come between humans and their understanding of animals. Ditto the comment re Mrs. Murphy series, also “The Cat Who…” series in that the writer obviously knows well the subject animals’ behaviors. Also enjoyed the series written about a Carmel, CA cat–Joe? All enhanced by portrayal of animal behavior and a certain amount of sass. Currently working my way through Laurie R. Kings’ output including a series involving the feminist wife of Sherlock Holmes, Mary Russell, an orphaned Anglo-American half Jewish intellectual (!) who goes on to read theology at Oxford when not dragged away on a case with her older husband. Books are set in locales relevant to historical 1920’s England. The concept of a ‘soul’ is of human manufacture. But love never dies. I also got a kick out of the Chet and Bernie series. I also love the Andy Carpenter series written by David Rosenfelt. They are about a lawyer solving some mystery surrounding his client and always include his beloved golden retriever, Tara. These are also popcorn books but they are written with great humor, wonderful charecters and loveable dogs. My theory is that if humans are allowed to have souls than animals, especially dogs do too. In terms of my own spiritual beliefs, I am an atheist, but I LOVE the Rainbow Bridge idea, even though it is a bit sappy. I have a wonderful conceptual image of my families space at the Rainbow Bridge where all of our family’s dogs are hanging out with my Mom who passed away five years ago. Do I really believe it? No, but it is a very comforting image to dwell on. Just finished two non-fiction books about dogs: A Big Little Life, a memoir of a joyful dog named Trixie by Dean Koontz and Until Tuesday by Luis Carlos Montalvan. They were both really good and relative to the topic of do animals have souls – both authors give their own examples. I’d never read Koontz but in this book he is so accurate in describing how people feel about their dogs and he’s also very funny. I will keep this book on my shelf. He’s serious when he says Trixie was an angel. I used to love the Rita Mae Brown’s books but then got tired. I tried the Chet books, but it never clicked. Though the description of hearing it on cd sounds like fun, I’ll try that. If love is God’s gift, it would make sense that any creature who loves has a soul. For Christian doctrine that says one must accept Christ as our Savior to be admitted to heaven, because animals are not guilty of original sin, they are exempt. Regardless, if there is an afterlife, it won’t be heaven unless it’s w/ my animals. Thank you so much for the new book recommendations Trish! I never take your recommendations lightly – if the book was good enough for you to recommend, then it’s good enough for me to buy and read. Thank goodness I have a Kindle, so I can store all of my books until I find time to read them (retirement, perhaps?). I’m not particularly religious (although I do believe in God), but I am really looking forward to reading “The Divine Life of Animals” – because I am firmly in the camp with those that know that animals have souls and that they surely go through the pearly gates far more easily than the majority of humans. I am putting the Chet and Bernie books on my Christmas list, because they sound like the perfect books to read when things get super busy at work and I can’t concentrate on heavy reading. I remember asking my father if my pets will go to heaven and will I see them again. He told me he wasn’t sure, but if God could remember all the souls of every human on earth, he certainly has the ability to remember all our animals. It did make me feel better. For some light reading, I like Rita Mae Brown’s mysteries. The cat and dog talk to each other in a way I imagine mine would. Basically the cat cursing the dog every now and then. On a dog behavior chat group a girl was asking about The Other End of the Leash. It was recommended by me and many others as a favorite, must read. I said that in the bookstore I put it front and center, so as many people as possible will see it. I don’t believe in heaven for humans, so dogs can’t go there either! The whole Rainbow Bridge concept sets my teeth on edge and for me almost trivialises grief. I do think there is some kind of life essence which all beings have and that probably persists throughout time, but not with any individual soul attached. As if a life was like a stream going into a river. Once it’s in the river, it loses its identity. One of my favourite authors is the late, lamented Diana Wynne Jones, and she wrote a book about a dog, called Dogsbody. It’s a book for teenagers, but don’t let that put you off. Many of Dean Koontz’ thrillers have a Golden Retriever in them, but his The Darkest Evening of the Year is actually about GR rescue. One of my all time favorite books is ‘Winterdance’ by Gary Paulsen. It’s about his journey to the Iditarod and at the Iditarod. Here’s to his dog, Cookie! It has several laugh out loud moments you will need to explain to Jim why you are laughing. I don’t know if I have a soul, but if I do, then surely my dogs must too. They are certainly spiritual beings. I like to think that something persists after we die–call it a soul if you like, and that those we’ve been closest too in life, including our dogs, will be waiting for us. Thank you for the recommendations. I have downloaded samples already. In the way of a recommendation, you might try, “The Angel by My Side”, by Mike Lingenfelter. When my “forever” dog, Murphy died from T-Cell Lymphoma two years ago, his oncologist gave me the book. It’s a true story of a Golden Retriever named Dakota and his impact on the life of the author. The conundrum about dogs, souls, and the rainbow bridge, as I understand it, is that if dogs have souls (and I believe they do), then they have personal destinies, which means that they have their own new lives to pursue which doesn’t involve hanging around the Rainbow Bridge waiting for me to show up. And yet I will be more than heartbroken–I’m with that driver, I don’t want to go–unless I can be with my four golden retrievers in heaven or another life. I feel clutchy and grabby and panic stricken even thinking about a time without them! So yes, I believe in souls and don’t really believe in the Rainbow Bridge but try to pretend that I do to keep the demons at bay. I do not believe in a higher power in the heavens. Nor do I believe that my beloved dogs wait for me anywhere. I believe that we, like everything else–object and living being–are made of energy, and I think that energy mixes with others and….??? That’s where I’m at with this. But most definitely not my loved one in their original shells waiting. I feel very connected to animals mine but also the ones who stay with me during a housesit. It is rare if you see me without at least one dog near me. I feel very lucky to have a strong four legged extended family. But I am also very willing to mourn their departure and go on–in the same way they would. Fabulous books I’ve read in the last year: A three Dog Life, by Abigail Thomas. She is a wonderful writer, but I especially loved this one. A memoir about the years following her husband’s tragic car accident leaving him permanently in a care facility and her, having to start a new life. The Chronology of Water, by Lidia Yuknawitch, a gritty, raw, the way it really is, memoir of her self-destructive years from Olympic hopeful to finding the love of her life. How to be a Productive Writer, by Sage Cohen an award winner writer who gives us all the strategies needed to stay on task for any writing project. Yes, I believe that my dog and cats have souls just as they have their own personalities. One of the best books that I’ve read recently, which hasn’t already been recommended, is: ‘The Immortal Life of Henrietta Lacks’. It is an excellant first book and I can not wait until the author choses a new topic and writes her second. I’ll throw in a rec for W. Bruce Cameron’s novel “A Dog’s Purpose,” which I found funny and observant and convincingly narrated from a dog’s point of view. Yes, it’s emotionally manipulative, and yes, it’s sometimes sappy… but, for me, it WORKED, and it’s a rare piece of fiction that works for me these days. The thing about being a novelist is, it becomes harder and harder to appreciate a story for what it is, instead of analyzing it piece by piece for the quality and construction of its artifice. So when I find a book that makes me forget about all that and get absorbed in the story it’s telling, well, that’s worth a lot. And “A Dog’s Purpose” was one of those books. Good popcorn, IMO. I know what you mean about not always enjoying books written from the dog’s point of view. But check out The Purpose of a Dog – I loved it! The only book on my Nook reader so far (other than the free ones it came with) is “A Tale of Two Species,” by one of my all-time favorite authors, whose name is probably pretty familiar to you. I enjoyed every page of it! I love the Chet & Bernie books! I get such a kick out of how easily Chet can be distracted by something (a dusty old cheetoh found under a piece of furniture) and completely lose his train of thought, and by how he stares at Bernie’s nose and is amazed at how useless it is. I was also bothered by “The Art of Racing in the Rain” mainly because of the dog’s desire to be human. That really bothered me, why would they want that? One of my all-time favorite books told from the dog’s point of view, although the dog does not narrate the story, is Donald McCaig’s “Nop’s Trial.” This was a book I found by accident years ago, while searching out books on sheepherding. That book just wrenched on my heartstrings like “Black Beauty” did when I was a child. “The Divine Life of Animals” sounds very interesting, but I have to say that I am bothered by the use of the word “soul.” I always associate that word with Catholicism, and we know what their view is on animals having them. I prefer to use the word “spirit” or “energy,” as I do believe that this is something that we all have, and is something that is always there and continues to live on after our physical bodies are worn out. It’s the energetic spark that brings life to our cells and gives each of us our individual personality, no matter what species we are. I LOVE Chet & Bernie!!!!!! I’ve told several co-workers about the books and they are hooked too! Whoops! Forgot my favorite books. The dog books are: The Story of Edgar Sawtelle (Wroblewski), Walking in Circles Before Lying Down was a hoot (Markoe), One Good Dog (Wilson), A Dog’s Purpose (Cameron), Last Dog on the Hill-The Extraordinary Life of Lou (Duno), Sweetwater Creek (Siddons). Other non-dog books: Shutter Island had a surprise ending (I hadn’t seen the movie), The Pact-A Love Story (Picoult), The Help (Stockett), The Kite Runner (Hosseini), Killer Angels (Shaara), My Old True Love (Adams), Wesley the Owl (O’Brien), Gates of Fire-The Battle of Thermopylae (Pressfield), the Odd Thomas books by Koontz, the Mercy Thompson series by Briggs, all the early Sookie Stackhouse series by Harris, My Grandfather’s Son by Clarence Thomas. Obviously photoshopped, but still hilarious. Souls? Whatever are we talking about here? I am kind of surprised to see someone in academia asking a question like this. Thank you for the Chet and Bernie recommendation! I just read the first book (Dog On It) and loved it! Rough week last week and that was just what I needed. I also LOVE finding a new series. Speaking of series, Chet reminded me a little of the Joe Gray series by Shirley Rousseau Murphy, although Joe Gray is a cat. They are fabulous books. As is Homer’s Odyssey about a cat and mentioned above. Have you read Your Dog Is Your Mirror by Kevin Behan? Just got it but haven’t read it yet. I believe that if humans have souls than animals do too. I am firmly in the camp of wanting to go where they go – if we go anywhere.